The hotel business is VERY competitive. Those serious about it approach hospitality with a level of commitment that is almost like a religious calling. Here at Fitzpatrick Hotels, our mission is to exceed the expectations of our guests by providing personal attention and unparalleled service that inspires them to return again, and again. We live this mission every day. We don’t often offer praise to our competition – the type of professional passion we are talking about just does not allow for it. But something significant happened last week that warrants an exception to this rule. On March 1st, when their last guest checked out at 12pm, the great Waldorf Astoria shut its doors and closed. Located at almost the midway point between our two hotels on Lexington Avenue, ours were two of the closest hotels to the Waldorf Astoria. However, it was not just another competitor. The Waldorf really put the hospitality industry on the map here in the United States. The original Waldorf opened in 1893, and it moved to its current location 86 years ago, in 1931. It was the tallest hotel in world at the time, and remained so for almost 35 years. It made a splash quickly, and became the “Mecca” for lavish hospitality and opulence, in its rooms, in its restaurants and in its function spaces. The largest of these functions spaces is its Grand Ballroom, which has ceilings almost 50 feet high, and can seat 1,500 people for dinner. The Waldorf was an innovator in so many ways. They invented room service, which other hotels quickly copied. Then, they invented 24-hour room service, which wasn’t as easy to copy. Talk about progressive? In 1931, they were the first hotel to hire women as chefs, long before Julia Child came along to make it fashionable. Many food and beverage favorites were invented there – the Rob Roy cocktail, Red Velvet Cake, Eggs Benedict, the Martini (yes…THE Martini), and of course, the Waldorf Salad. The Waldorf was the first hotel in the U.S. to become a “celebrity haunt” – a place where people went specifically to be seen. The list of famous guests is endless, but notables included Queen Elizabeth II, Elizabeth Taylor, Gregory Peck, Charlie Chaplin, Judy Garland, John Wayne, Muhammad Ali and the Dalai Lama. Some celebrities even used the hotel as their residence for long periods of time. This list includes Marilyn Monroe, the Duke and Duchess of Windsor, and Frank Sinatra, who lived in “The Cole Porter Suite” and hung out in Sir Harry’s Bar, right of the lobby. Every President of the United States going all the way back to Herbert Hoover has stayed at the Waldorf while in New York. It might have been the only hotel in the world where the term “Presidential Suite” was completely literal. Although, we come close at Fitzpatrick Manhattan, where every Irish President stayed since opening in 1991. All of this buzz very firmly established the Waldorf as the yardstick by which other hotels were measured. This pushed other hotels to elevate their product and service, and by extension reshaped the hospitality industry into a bona fide professional field here in the United States. For that, we say “Thank you, Waldorf Astoria”. Like many institutions, the Waldorf had aged a bit in more recent years, and while she may not have had quite the same luster that she used too, the Waldorf still had a certain mystique that was completely its own. I’m sure many other hoteliers around the world – especially those here in New York – also felt a pang of remorse at the closing of the iconic Waldorf’s doors. We would like to take this opportunity to raise a glass to the Waldorf and thank the iconic hotel for raising the bar in hotel hospitality, giving us all something to aspire to. 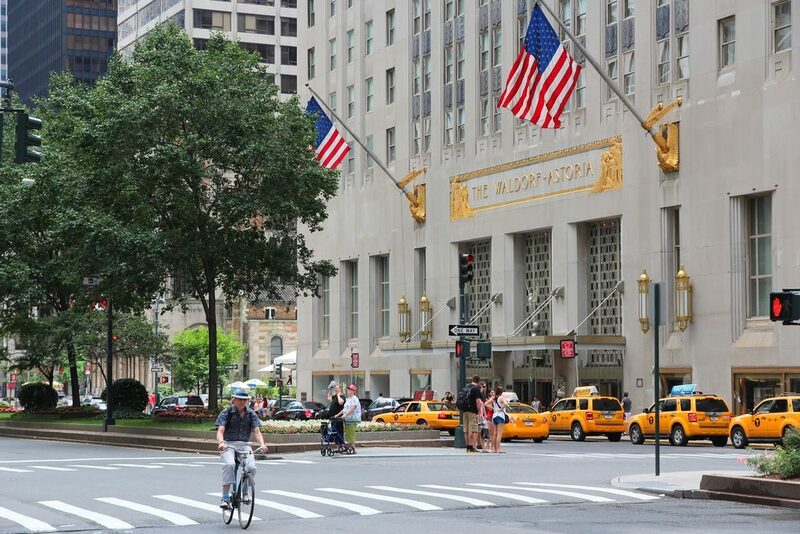 We at Fitzpatrick’s realize that many regular guests of the Waldorf might need to find a new hotel near the Waldorf when in New York. We would love to welcome you, please mention this tribute to our reservations team, or use the promotional code WALD10 on our website, and we would be delighted to offer you a 10% discount of off our Best Available Rate. Please click here for Fitzpatrick Manhattan and here for Fitzpatrick Grand Central.